Azerbaijan is among those few countries in the world with space programs, rector of the Azerbaijan National Aviation Academy, chairman of the Council for Space Affairs, academician Arif Pashayev said at the event organized on the occasion of awarding the winners of the CanSat Azerbaijan 2018 competition. Greeting the guests, Pashayev briefly talked about the competition, stressing that the idea belongs to the Azerbaijani Ministry of Education and Azercosmos OJSC. "About 200 students from 11 universities of the country took part in the CanSat Azerbaijan competition,” he said. “Sixty-six of 200 students became finalists. There are no losers in this competition as the participants got a lot of experience as designers and programmers. I wish all finalists new victories." “The jury, headed by Professor of the US University of Maryland, prominent scientist in the field of space research, academician Roald Sagdeev has a great merit in holding the competition,” Pashayev added. During the event, Sagdeev also offered to hold CanSat Azerbaijan competition among the Azerbaijani secondary schools. 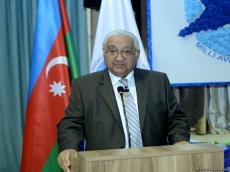 “It will be possible to attract schoolchildren to this competition, which will be another step taken by the Azerbaijani Ministry of Education together with Azercosmos,” he said. "Several years ago, teams from the Azerbaijan National Aviation Academy participated in the US CanSat competition,” Sagdeev said. “The students from ADA University also took part in this competition. The teams from Baku participated quite well. Afterwards, at the initiative of Azercosmos, the idea was implemented in Azerbaijan." He stressed that 61 years ago the first satellite was launched, and even then the designers, project managers knew that it was good to attract more people, young people, and in particular, radio amateurs for monitoring the first satellite. “Radio amateurs worldwide could receive signals from this satellite,” Sagdeev added. “This tradition continues. As the space program was developing, many enthusiasts - rocket engineers have emerged. NASA specialists had the idea to organize special competitions among students in the US, and some time later, students from other countries were invited to participate. The competition was named CanSat." “The task of the competition participants was to fit the satellite into a small jar, with all its functioning electronics, with the ability to conduct research (temperature and pressure measurement, image taking, etc. ),” he said. “It was also the design with which they were to participate in the competition,” he said. “According to the results of the first stage, 10 teams were invited. Microsatellites were launched in September. Despite weather was windy and there were many obstacles, the competition was successful. The participants fulfilled all the conditions of the competition. There are no losers in this competition. This creative competition will become a tradition and the number of participants will be increasing."